It’s been some time since I’ve typed into this space. I feel like I have good reasons. If you don’t follow me on social media, then I’ll say it here: we’re expecting a human. So far growing a human hasn’t taken too much of a toll on me, and most days I doubt I’m even pregnant. However, first trimester did take away motivation, and I did sleep for more hours than I normally do. I’ve entered second trimester not too long ago, and this past weekend our house was clean and I just wanted to make something! I have been dreaming of a Christmas Cookie Exchange party, so I’ve had cookies on my mind. 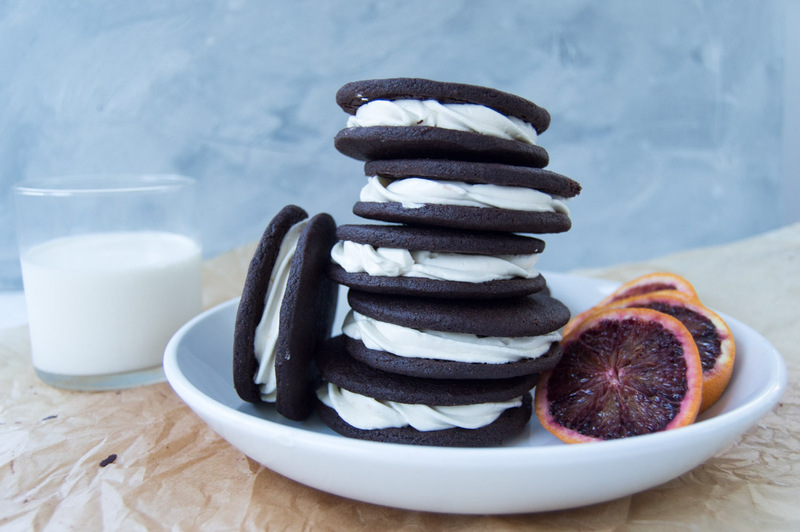 I came up with these chocolate blood orange cookie sandwiches. I knew I wanted to adapt Bouchon Bakery’s chocolate shortbread cookie, and I feel like orange and chocolate go together this time of year. My next quest was, what exactly should the filling be? If you know me, you know I like baking but I don’t like things to be icky sweet. Ack. I’ve been on a Swiss Buttercream kick lately, so why not just make that the filling? There’s blood orange zest in the cookie dough and zest and juice in the filling. They’re honestly such a simple cookie to make that look really nice. The taste? Oh they’re tasty, there’s no doubt about that! Now that we’re growing a human I’ve been going back and forth on whether to share more on a personal level here in this space. I wanted this space to grow myself as a baker, cook, writer, and photographer. I’m an amateur in all areas, and I’ll for sure be an amateur parent, so why not add that to the list? I’ve shared a few posts on social media about my feelings to this unknown abyss we’ll be walking into. We’ll see. For now enjoy these cookies and share! For the cookies-Start with the cookies first so you allow time for them to cool after they’ve baked. ∙This mix can look very sandy, but if you can take your hand and clump it together and it stays, it’s done mixing. ∙Form a dough ball with your hand can roll out dough between two pieces of parchment paper. I rolled it our to roughly a quarter inch. You can use whatever size cookie cutter you’d like. I used a 2 inch cutter and was able to create a dozen cookies. Just know that whatever size your cutter is may change the bake time on these. It’s hard to tell when these are done since they are chocolate. These cookies don’t expand too much, but still make enough space in between cookies on tray just in case. 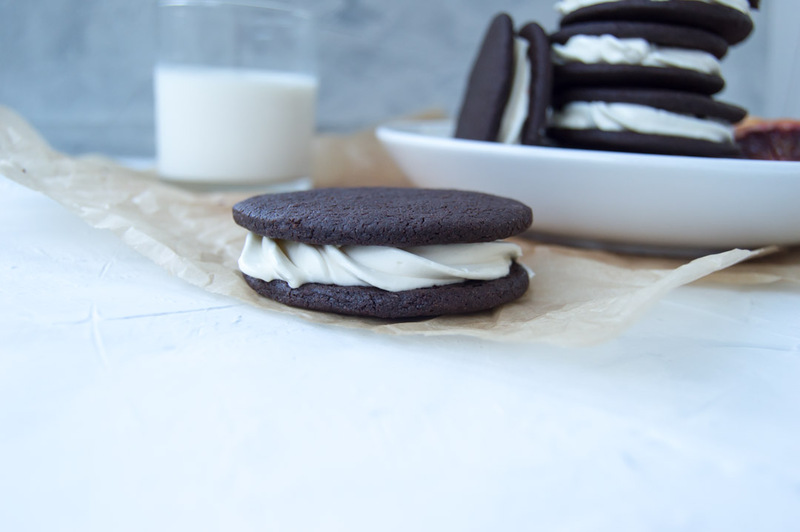 ∙Allow cookies to completely cool before piping filling in or else the obvious will happen. ∙Measure out your butter and set aside. ∙Measure out your egg whites in sugar into a bowl that can be placed over boiling water. I usually just use my mixer’s metal bowl so I don’t have to transfer to it later. ∙Fill a sauce pan with water. You don’t want the water so high that it touches the bowl. ∙Turn your pot of water on medium heat and place your bowl of egg whites and sugar over the water. ∙Once you’re at 160 place this in your mixer with the whisk attachment, whip on high until stiff peaks. The only way you’ll truly mess up Swiss buttercream is if you rush steps and even then you can’t really mess it up you’ll just have to whip it longer. ∙Once you have stiff peaks, slowly start adding in your butter. Do a tablespoon at a time and wait for each chunk of butter to get incorporated. ∙When your butter has all been added, you want to whisk on high until you have stiff peaks again. Once I got stiff peaks, I added in zest and slowly added in juice. 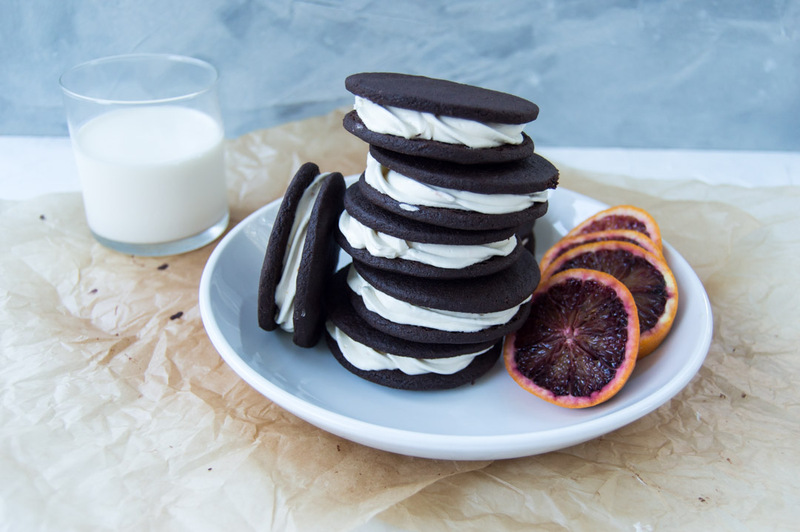 ∙You can pipe these in with or just scoop the filling in, however you’d like to do it. I used a piping bag with a star tip.